My brother in law is a cracker jack financial advisor who has been helping hundreds of fortunate clients manage the recession. The title of his blog this week was “No Inflation Unless You Eat“. 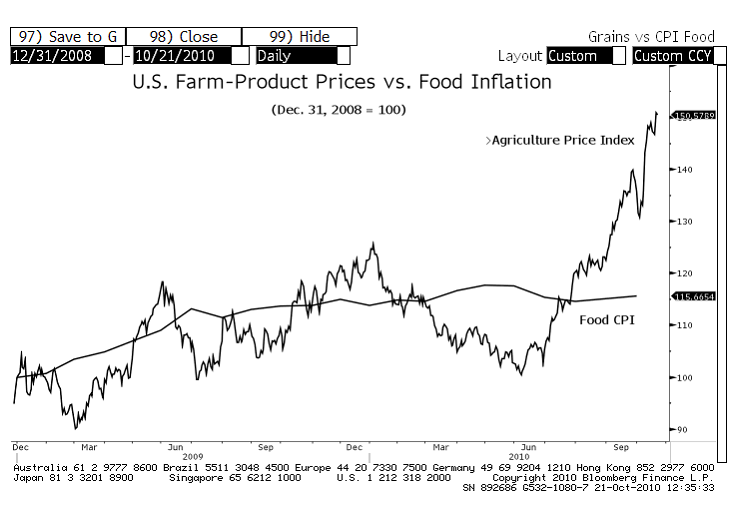 Apparently, the Fed omits the price of food when calculating the Core CPI but as Jay points out, “most of us don’t live in a core world.” I can appreciate his issue with the numbers and the underlying increase in food costs but it also caused me to think about all sorts of food and income related issues. For example, how much do we spend on food and is it true that eating well has a class divide? In a study of 51 countries that house nearly half of the world’s population, results show that the richer a country is, the smaller the percentage of income that is spent on food. In India, 51% of household income goes to food compared to 27% in South Africa. France, Italy, Sweden and Australia hover between 14 and 17% and the U.S. allocates just over 10% to food. I guess those results may be intuitive to some. But that’s only part of the story. I loved the scene in Food, Inc. where Joe Salatin was airing his frustrations at consumers who lamented the price of his eggs while downing a big-gulp cola. Fact is, while the U.S. enjoys relatively low, but rising food prices, we have the highest caloric intake amongst nations and the highest % of food purchased that is not prepared in the home. There will be some that say I’m making too big of a leap but what if we spent a greater % of our income on food that was high quality, fresh and unprocessed resulting in lower caloric intake? A recent proposal by NYC Mayor Michael Bloomberg that suggests food stamp recipients be prohibited from purchasing soft drinks is receiving a great deal of criticism from those who say that it penalizes low income residents and that government has no place regulating food consumption. Should government be able to impose restrictions on a program like this and if showed a corresponding benefit in healthcare costs would that change the answer? A bit of research in my community has uncovered that a family of five with food stamp benefits receives $30 per person per week or $150 weekly. Can I feed my family good quality slow food for that amount? Can you feed yours? We’re going to give it a try and I’ll be back to blog about the results. Preheat oven to 300. 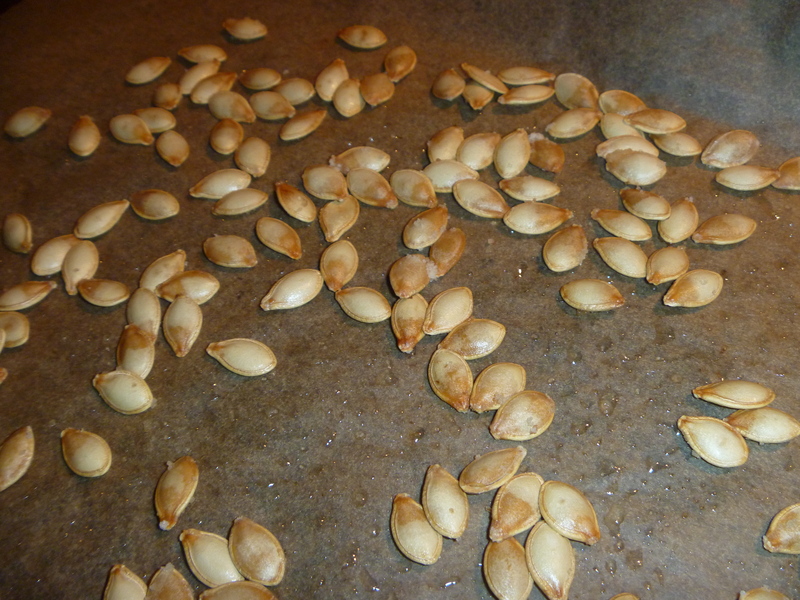 Toss pumpkin seeds with olive oil, salt and pepper. Place on a cookie sheet covered with parchment paper. I roast for about 10 minutes or until I hear the seeds begin to pop. Do You Have the Huevos? This is a huge issue. I’m in support of a) farmers markets ALL accepting EBT cards (food stamps) and b) more programs that double the purchase for EBT users (spend a dollar, get two dollars worth of produce). I believe Boston piloted such a program this year, subsidized by the city. I do believe the $30 a week budget could work; a family would need to eat very little (if any meat) and no packaged/processed foods. It’s amazing how cheap whole ingredients are—ah, but that’s why food is big business, isn’t it? I think the world would be so much better if all governments incentivised farming, made it a viable way of life – like it used to be. Incentivize and subsidize are two different things. I’m not sure how the mechanics work but there has to be a better answer. Education in food is still key to people changing how they eat and how they feed their families. Thankfully there is more discussion of nutrition in schools, there are more documentaries like Food Inc. and Fresh, and there are TV programs like Jamie Oliver’s show. It feels like there is energy moving in the right direction albeit slowly. I will be curious to see how you manage a food budget of $150; our food budget has increased by at least 25% from me trying to serve more healthy meals and snacks. But I am just a beginner in this world. I agree with you that education is key Bonnie. I honestly believe (esp. after watching Jamie Oliver) that people have not learned how to eat well. I also support the Bloomberg model but was not expecting to hear the same from you. I’m not sure when we’ll do the $150 but I’ll report back. Hi Tammy, What a pertinent issue in today’s world… This country really has its problems –and I feel that the LESS Government control and involvement –the better off we will be. The incentive to work is almost gone now… Why would someone want to work when he/she gets unemployment for such a long time –and also gets other govt. benefits such as food stamps. I don’t want to sound cruel… I know there are some very deserving people out there –who do need help. Wish we could find ways to help the truly needy –without having others take advantage of the system… Big ISSUES for sure. Thanks for coming to my blog. Hope you come back soon. Thanks for your comment Betsy. I think I’m in agreement with Bonnie that if the government is handing it out, then the government can say how it is to be spent. After all, we’re a democracy and therefore we are the government. Food issues are really going to escalate if we don’t challenge some of the current practices. The government SHOULD prohibit purchase of soft drinks and other “empty calories” with food stamps. It does NOT penalize low income people . . . it protects them from their ignorance and educates them about how to make better food choices. I’m in agreement with you Nancy but was hoping to coax out a real libertarian point of view from someone so that we’d see the full range of the argument. If one is to spend, good, nourishing *real* food would be the best choice. On the other hand it’s disturbing that we have to pay high prices to NOT be poisoned. Always strikes me as odd too but I think the sustainable practices are worth the extra. Very important, and very difficult issue. I just wonder because I often think processed foods aren’t so cheap overall … I agree it will be hard to really nourish yourself with 30 $ a week, but if you spend it on processed foods you’ll remain malnourished as well. Are you really going to try this? That would be very interesting! And I actually might join in because I’m very, very tight with my finances this month. I’m happy to be able to pay my rent and piano lessons, but almost nothing to live on. Gah. I honestly think it’s harder for one person Kath but commend you for being willing to try. We’ve got to “gear up” for it. Interesting you mentioned Food, Inc. It struck me in that movie, when they were showing the family of four that said they couldn’t afford healthy food (like fresh cabbage) for their children, so they ate at McDonald’s instead, and bought huge bottles of soda, saying it was cheap. However, the father was spending over $300 a month on his diabetes medication (out of pocket, since he didn’t have health insurance). All I could think was, for the same price as the McDonalds meal, they could have simple dinners like rice and beans, and drink water instead of soda, which would be way healthier, and possibly be able to reduce his medication needs. When my girls were little, we were on a super tight budget, but I always managed to make healthy meals. It’s not impossible, but people definitely need to be educated as to how to accomplish it. Yeah! You can be my inspiration and I LIVED on beans and rice in graduate school. These issues are something I’m really interested it as, at the moment, I’m starting work on a PhD related to ethical consumption, and one of the things I’m thinking of looking at is the locavore movement in terms of not only community-building and socio-cultural factors but status/prestige/economic factors too. I may not end up focusing my PhD on this, but at the moment that’s the direction I’m moving in. I think what a lot of people forget when talking about the class divide is that it doesn’t come down *just* to money – there are also issues of awareness, knowledge, education, and accessibility, which are often class-stratified even if, in some cases, it might be “cheaper” to shop at a farmers market. Amen Hannah. The class divide is about so much more than $. Your PhD sounds fascinating. I hope you’ll share more as you study. To be able to eat healthy food, you also need to be able to buy it without taking four buses. Many of Philadelphia’s poor neighborhoods are served by corner stores that offer little or no fresh produce. Great article Laura. That is definitely an issue that I hadn’t considered although I think they are referred to as food deserts. Thank you for this blog post, Tammy. So much education needs to be done around this subject. More than once I’ve heard poor people criticized for being obese — the malnutrition aspect was unseen. A second issue has to do with working poor folks. With two parents working, there simply isn’t time to make items that take a long time to cook, such as beans. For affluent two-parent households, it’s not a big deal to stop at a restaurant or grocery store offering quality meals to go. Beans can be cooked in huge batches and frozen in small portions. Canned beans are ready to eat and are less expensive than buying a soda or hamburger at McD’s. Thanks for reading Diane. Check out the statistics in the article that Laura posted regarding nonpoor vs. poor. Neither fares well but there is a clear divide. Time is certainly a factor also but I’m inclined to think we can educate around it? Thanks Nancy. I really like the section called Cooking Matters and the Great American Bake Sale. As much as I sometimes don’t like ConAgra, they sure do a great job with their philanthropic activities in this area. I live on a farm in the south west of France and people around here still spend about 25% of their income on food, because they believe in quality not quantity, thank goodness. All is not perfect as we still massive subsidies for farmers, but as you said in one of your comments, that is another major issue that is being addressed in Europe. We’ll see what happens in France in a couple of years when it stops. Thanks for visiting Crystal. This issue of food is so complex. It’s hard to know where to begin and how. Farm subsidies are another huge issue not only in Europe but that will have to be a future post. Great post! We volunteer monthly at the local food bank which has been proven to be a good education in 1. food waste in our food system (the amount that gets damaged and tossed aside), and 2. the amount of prepackaged goods and unhealthy products (pop, candy) handed out in hampers. I’ve always dreamed of how a cooking education class could be provided in conjunction with these low income food programs in order to teach people how to eat healthier but cheaper (i.e. how to use dried beans and legumes, as well as fresh vegetables, finding other sources of protein, etc). I look forward to hearing about your family’s experience of spending $150/week on food. Sounds like an achievable goal. Good luck! Interesting point that you raise Deb. My husband and oldest son volunteered at the food bank this weekend and I was thinking about that very issue. What do most of us drop off as our donations. I think your dream is perfect! We handout beans and crockpots and lessons. I lived with nothing but for two years while in grad school. This was a really smart post, Tammy. Personally, I like Mayor Bloomberg’s idea of restricting what people can buy with their food stamps, but it really opens up a can of worms. Plus, I think this is really a systemic problem. It isn’t just that people are buying soft drinks with their food stamps. I think farm subsidies, school lunch programs, nutritional education (or lack thereof) and a host of other issues factor into it, and I have no idea how you’d even begin addressing them. The chart and related article is wonderful and eye opening. It says a lot about the role of lobbyists. I agree that the food issues are broad and systemic and the only way that I can think about is is through education. I’m very interested in reading about your $150 a week experiment. It sounds to me like it could be done pretty easily, but I’m fortunate enough not to have to count my pennies like that. I certainly don’t mind spending a little more for an organic squash, but I’m sure there are people who can’t afford little luxuries like that. The funny thing is, local, seasonal food raised without pesticides should be cheaper than food grown hundreds of miles away that has to be stored, transported, and preserved. I don’t know Camille but I’m starting to plan. I think it’s going to be a great learning experience for me one way or the other and will definitely shape my future actions on food and food issues. Feeding a family of 5 on $150 a week? good luck. Sure, if you go to Save-a-lot or costco you might be able to do it, but local, organic food? I’m skeptical. I spent over $20 and we’ll (me and my husband) eat all that food within the next couple days. I am currently enrolled in WIC (Women, Infants & Children) and get a whopping $10/month to spend on fruits and vegetables. They don’t need to be fresh. There is a serious disconnect between what is good for the consumer and the farmer and what the policy makers decide on in Washington. How about some subsidies for organic farmers? I believe you’re speaking to the issue of lobbyists. I agree about the disconnect. My husband and I were just discussing the same. By the way, I saw your beautiful purchases on your blog. Enjoy every bite. Great post as always Tammy. A lot of great information, how do you round up so many facts? I’m interested to see how your experiment turns out! Thanks Ollin. I do have to hunt for information but if you scroll the comments, you’ll note a lot of great sources from others. I will be interested to see how your project goes as well 🙂 My sister did something similar when she was in college and I recall her planning meals with a lot of rice and beans (especially lentils). Funny you should ask. I have a call into the Community Action Alliance to ask the same question. I’m hopeful that lunch is in addition to the $150 and more than the $, it’s for the convenience of doing this. My kids will not necessarily be disciplined at lunch time. The farmers who work so hard growing those wonderful organic veggies certainly do not live “elitist lives,” but are getting a fair price for their goods. And, even then, they are far from wealthy. We know that the issue lies with the subsidies to the industrialized food system, king corn, wheat, soybeans and not to the locals. I agree with Deb–Food Education is key. Teaching people how to cook healthy but cheap meals for themselves will go far. It will be great to see how you manage your $150week project for your family—it can be done, (lotsa stews/beans-rice/eggs/peanut butter) leaving meats pretty much out of the equation. Nancy, I didn’t include it in the post but I’ve read that the farmers who are not going through CSAs or Markets are only getting 20% of the total price. I agree that the discussion is good. So many interesting resources. Hmm, this sounds like a good reason to get to know your local farmers personally. I grow a little of my own food but currently have too much shade to delve deeply into it. Yes. I have a small garden but we also know our farmer! Great post and on a great topic that always brings loads of good discussion/debate. I think the access to the right produce is key. Here in SF certain farmer’s markets can cost you an arm and a leg for their produce but those that are a bit off the beaten path offer great produce at reasonable prices. I think price is part of the equation, the other is that people eat a lot of prepared food, ie pasta sauce that is typically more expensive and I would argue less healthy too. However for a family where both parents have to work, trying to cook completely from scratch can be a struggle, especially if cooking is not their thing. I love the food stamps and the farmers markets and applaud it. Our farmer’s market takes food stamps although I have no idea how often they are actually received. On the working front, I agree. It’s hard but I’ve made it a priority in our home and while we are far from perfect, it is doable. Thanks for the visit Naomi. 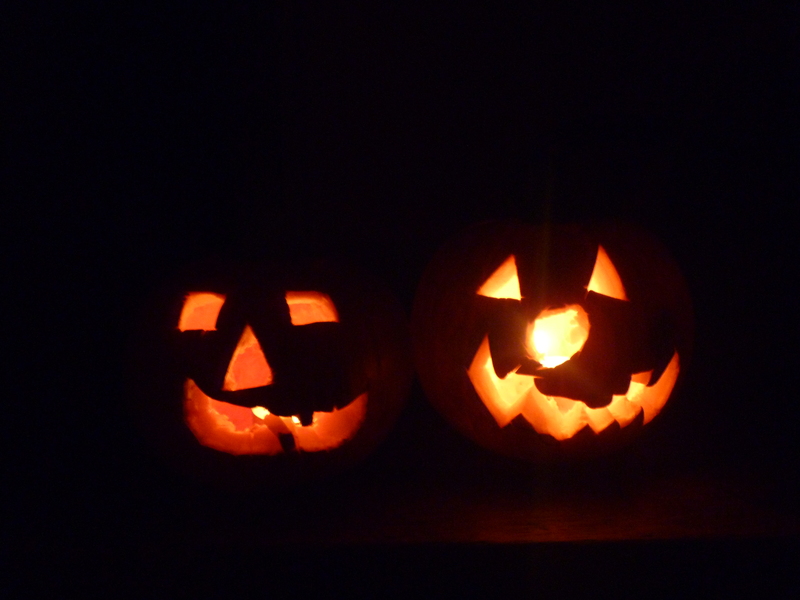 And my youngest who loves the pumpkin seeds has me roasting melon seeds and squash seeds also. I do think I get a great education at your site. I hope you do the experiment…let us know! This post doesn’t really apply with the currency and everything to my country, but just wanted to say: those lanterns are so cute! Thanks Estrella. Here in the desert heat, they only last about a day! Thanks for reading Kathleen. We also spend a lot on food. It will be interesting to see if we can do this. We’re starting in a couple of weeks. Our local farmer’s markets have begun taking food stamps this year, which is a positive sign. I wonder, however, if we can ever stop subsidizing corn and soy to the extent we are: that’s why all our food appears to be corn these days. I have no idea how much the limits are around here (re food stamps), or how often they are used, but at least this is something. I love to cook so most of my stuff is indeed from scratch. I also get control over what goes into it, as well as saving some money. Our market takes food stamps also and it is a positive sign. I’m hoping that I can cook from scratch on the $30 per person per day budget. I have read through a lot of these comments- all very interesting. Any mention of grow your own? And children being taught how to sow seeds and see where their food comes from? Maybe this is a lot of the problem. Many people don’t even know where the food comes from? Maybe a post on simple, economic nutritious meals would bring the recipes rolling in? Great comment. The $30 per person per week excludes anything grown on one’s own. In other words, that is a perfect way to supplement. There is a big problem in that many people do not know where their food comes from and yes, love the idea of collecting recipes. We are goind to try this in a couple of weeks. Another thought-provoking post! I’ll be waiting avidly to hear the results of your $30/person experiment! I’ve read some really interesting posts from people who’ve done similar experiments. One thing I learned from them that I hadn’t thought of before is that, if you really are living on a food stamp budget, buying something like a bottle of olive oil or a jar of dried herbs can take up such a huge chunk of your weekly budget that even though it breaks down to cost pennies per day it’s actually not a feasible purchase, since someone would have to go without food for a day in order to make the initial investment. So all the calculations I make for how much my meals cost are already based on my having the disposable income to buy things in bulk, etc. That was really eye-opening for me! I’ve been thinking about that. The Community Action Alliance here has set up a challenge and I think they are allowing use of spices that might already be purchased and my kids lunch are exempt since they would be on free lunch. But flour, oil, stuff like that might necessitate some processed foods.